As you come down the driveway, there are soybeans on one side and milo on the other; or depending on the season, wheat and canola. When you arrive, and ask for one of the owners, you might have just passed them out in the field, scouting the crops. For brothers Matt and Luke Jaeger, their business method hasn’t changed much in the 10 years since they started Emergent Green Energy, (EGE). With an ear to the ground for better farming, and eyes forward in creating quality crop protection services, their motto “Farmers Helping Farmers” rings true on a daily basis. Having grown up on the family farm in Leoti, KS, and presently farming in Minneola, KS, the two brothers have the experience to know what works and what drives the agricultural community. This knowledge has helped EGE progress from an upstart biodiesel producer and recycler, to growing and adding crop adjuvants as part of their repertoire. With the addition of the crop protection services, EGE’s team expanded to include a biological agricultural engineer, salesmen, plant technicians, drivers, and an office staff that all have the same objective – to provide excellent customer service as they deliver quality products at great prices. “Creating jobs has been a huge joy for us, and our employees make it happen every day for our customers and on our farm,” Matt says. The amazing support and loyalty of EGE’s customers made it easy to expand product distribution from Kansas to include Iowa, South Dakota. Nebraska, Colorado, Oklahoma, Texas, and Missouri. “Additionally, we are working with growers in the citrus industry to see if our products can help improve their bottom line as well. We are also working on product registration in California, and we would like to see those producers experience the same benefits that the rest of the country has seen with our products,” says Luke. While Matt and Luke have their hands in the Midwest soil, they also have an international mission. EGE is running tests in Central America to see if their products can help with controlling the Sigatoka fungus on banana trees. Big possibilities for a small American made manufacturing company! Even with all the exciting and expansive ideas, it all comes back to their customers, and a farmstead in Minneola. Matt and Luke climb in the combines every harvest, pulling their kids up in the cab with them to watch, and later help, as a year’s worth of sweat and labor come to fruition. 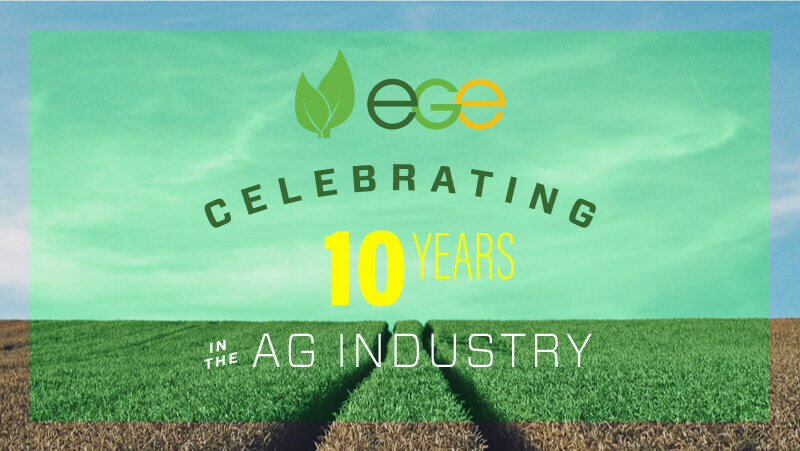 It’s been 10 years of moisture and drought, farm hands working long days keeping equipment repaired and running, and just about everyone in the family and EGE contributing to harvest in some way. This scene has been duplicated in agricultural communities across the nation and globe, and it is the basis for everything the Jaeger brothers have established with EGE. It’s their desire that their innovative knowledge, farming background, and products will enhance the effectiveness of chemical applications for your crops.